I'm dipping my toes in to modular synths by building some simple modules. One is the active multiple. I have attached my schematic here, and would love to hear your comments. Did I miss anything? A: I'm using stereo jacks (Because they are cheap). I leave the ring unconnected. 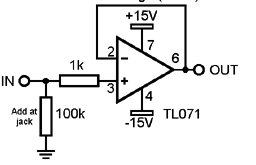 C: When the input is not connected, the input to the op amp is floating. How big of a problem do you feel that is? I'm about to order PCBs, but would like your comments before ordering. So, you are suggesting that I reconfigure my input according to the schematic you posted. Can you comment on the need for the resistors you suggest that I add to the input? Do you want to solve the problem of the floating input by adding the resistors sacrificing some precision in the input in the process?? I can see how the 100K would pull the input of the op amp to ground when it's not connected. What is the purpose of the 1K resistor? you only need 1 op amp stage. Some circuits have voltage followers (circuit I posted above) on each output, and some use one on the input. I think most Eurorack buffered mults simply send the input to 4 (or however many) separate voltage followers. And yes, add the resistor on the input. you only need 1 op amp stage. I'm not sure what you are suggesting here. I think you suggest that I should get rid of the op amp between the input and the 3 output op amps. B: It's a quad op amp, so why not use the last one too (Not a very good reason I confess) ? Some circuits have voltage followers (circuit I posted above) on each output, and some use one on the input. I have used one on the input as I understand it. Is there a reason not to do so? Is there a reason to do so? What are the pros and cons of each approach? And yes, add the resistor on the input. In your link, there is a single 1M resistor tying the input to GND. I assume it's there to make sure the input is not floating. So, that is different from the Ken Stone schematic, which also had a 1K resistor between the input and the op amp. What's the purpose of the 1K resistor suggested by Ken Stone? What are the pros & cons of using/not using it? you can use 2 op amp stages, but I suggested that it can be done with only 1 because you are looking to save space. And you could use a quad opamp for 4 outputs instead of 3. The reason why I have the "spare" op amp is, that I can only fit four jacks (Input + three outputs) in the tile form factor. I'm sorry for not being more specific. Any thoughts on the two different resistor configurations (one vs two resistors) on the input? Your feedback is much appreciated. Thank you. I was thinking bananas when I said you need the resistor to ground on the input, but if you are using switching jacks, it is not needed. Just tie the switch to ground, instead. I'm not using switching jacks, so I'll tie the input to ground with a 100K resistor. Any thoughts on the 1K resistor suggested by Ken Stone? Good stuff. My initial design was based off of that/those thread(s). I have re-read some of the posts. Thank you for pointing out the resource. That is what I was thinking as well. Thank you for taking the time to comment. It would probably be good to add that resistor. Are you aware of any downsides? I have added the two resistors to the input. Updated schematic attached. Thank you.